Shabaab, al Qaeda’s official branch in East Africa, has claimed responsibility for bombing an airliner bound for Djibouti on Feb. 2. The statement, which was released in English on social media, can be seen below. 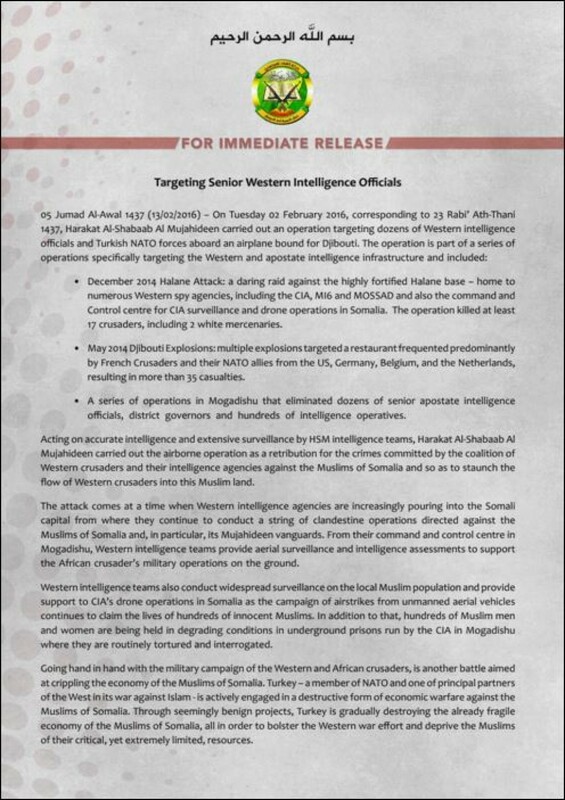 “The operation is part of a series of operations specifically targeting the Western and apostate intelligence infrastructure,” Shabaab claims. The group does not explain how the bomb supposedly targeted specific Western intelligence officials or their allies. The blast also failed to kill anyone on the jet other than the jihadist who carried it on board. CNN reported that the explosion would have done more damage had it occurred at a higher altitude. A delay in the flight may have prevented the attack from going off as planned. The bomb was reportedly concealed in a laptop and may have been undetected by airport X-rays. (It is not clear if the laptop was passed through an X-ray machine or around one.) Officials have released video footage showing the laptop being passed from one person to another at the airport beforehand. Shabaab does not provide any specific details concerning the bomb, or the “intelligence” officials who were supposedly targeted. But the group is eager to portray the failed attack as part of longer war between the jihadists and their adversaries in the CIA, British intelligence, and Israel’s Mossad. The al Qaeda branch claims in its statement that a December 2014 raid on the AMISOM Halane base camp in Mogadishu targeted all of these spy agencies. Shabaab also says that “17 crusaders, including 2 white mercenaries” were killed during the raid, but AMISOM’s statement on the gun fight indicated that “three AMISOM soldiers and a civilian contractor” perished. Shabaab previously claimed that the assault on the Halane base was revenge for the drone strike that killed the group’s emir, Ahmad Godane, in September 2014. Explosions in Djibouti in May 2014 that “targeted a restaurant frequented predominately by French Crusaders and their NATO allies” and a “series of operations in Mogadishu that eliminated dozens of senior apostate intelligence officials, district governors and hundreds of intelligence operatives” were also supposedly part of this same series of attacks. The passengers on the Daallo Airlines plane, including the suicide bomber who blew a hole in it, were originally scheduled to board a Turkish Airlines flight that was canceled. Shabaab implies that Turkey is a legitimate target. Thanks for posting the whole statement. They have some smart people on the propaganda brief. Much in there that’s hard to counter-message, and true if you believe Jeremy Scahill. That was a Turkish target… “bad weather” is a such a lame excuse in sunny Somalia. What did the Turks know about the threat? Al Asiri design? Not sure the skinnies have the chops for Mil TNT in laptops. Enemy is much more networked than we give them credit for. Again. And they made a joke of the tightest security in the country, if not the entire continent. Almost a big one. Very directly responding to Metrojet and the IS challenge. “Operational outbidding” at play (with WMD on the way). Watch for the Turks to cancel that route. Who flies to Somalia for fun and profit? Shabaab is so hungry for relevance that they take credit for a botched operation that killed only their operative, funny! Go back to terrorizing women & children, you’re much better at that. [Shabaab] intelligence teams…….definitely an oxymoron. the operation did not bring down the plane as Allah had decreed……..no virgins for you. Love your optimism. Wish I shared it. That attack was a big fat fail, just like shoebomb, undiebomb and printerbomb. However, those “failed” attacks cost the world billions and continue to negatively affect air travel and air delivery world-wide. I think that every bomb they get on an airframe is a win for them. One soda can of Semtex blew out the entire Sinai tourism industry and thousands of jobs (lives). Our systems are too fragile for the forces being arrayed against them. The threats are increasing, not decreasing, and making fun of their 72 bag ladies gets us nowhere. PS Ask the KDF if the Shabaab only target women and kids. Problem is we are facing a global Islamist insurgency that uses both terrorism (killing women and kids) and asymmetrical warfare (ambushes, surprise attacks, and green-on-blue) to great effect by mixing the two techniques and mixing the target set.